Started July 4, 2007, the Zaca fire burned for nearly two months before it was contained on September 2, 2007. Nearby Santa Barbara City residents watched and waited while this, the largest fire in the history of the county (240,207 acres total), moved ever closer to the inhabited front country. As firefighters battled, NASA’s MODIS Active Fire Mapping Program captured the active burn area several times a day. At the end of August, with towering heat clouds in the sky and ash covering the ground in Santa Barbara City, ACCESS DIAL project technical lead, Marty Landsfeld, noticed satellite data images in the local papers and determined that an animation of the progression of the fire would help inform the population. In one afternoon, using the DIAL technology, he was able to assemble an animation of 104 MODIS data images, including their date and time information. 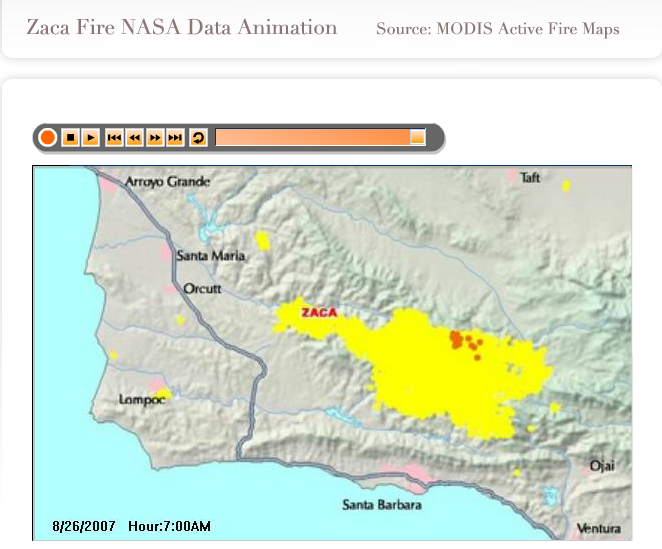 On August 28, the Zaca Fire NASA Data Animation was hosted on the web at NASA Zaca fire data animation. The URL was seeded to local media outlets. Within 48 hours more than 1000 information-hungry users viewed this resource. The DIAL technology leverages ITTVis’s IDL software for data access and analysis with Adobe Director’s user interface authoring tools.